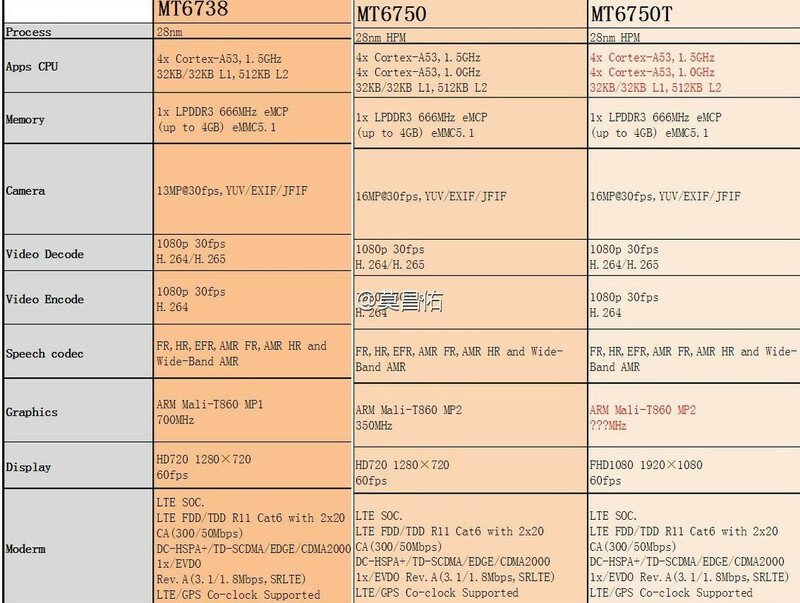 Mediatek will soon launch three new mobile SoCs based on ARM Cortex A53 cores and Mali-T860 GPU, as well as support for LTE Cat.6 modem, with MT6738, MT6750 & MT6750T processors targeting entry-level Android smartphones. All three processors are manufactured with 28nm process, support up to 4GB LPDDR3 RAM, decode H.264/H.265 up to 1080p30, encode H.264 up to 1080p, and support LTE FDD/TDD, DC-HDPA+, TS-SCDMA, EDGE, and CDMA2000. MT6738 features four Cortex A53 cores @ 1.5 GHz with a Mali-T860MP1 GPU, and supports 1280×720 displays, and up to 13MP cameras. 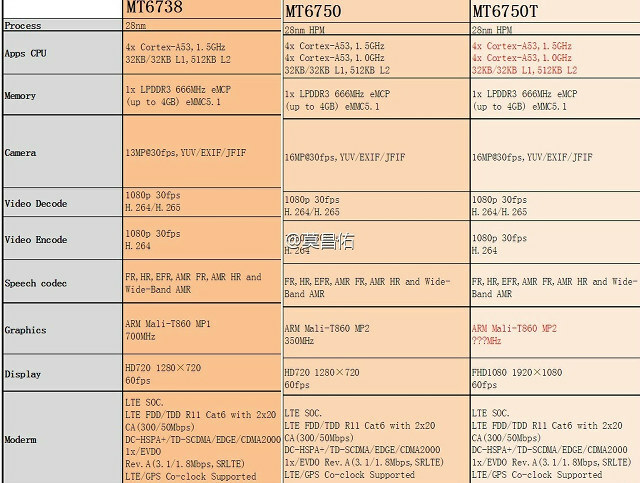 There’s no clear availability date, but mydrivers reports these SoCs will likely be found in phones selling for 300 to 600 CNY ($45 to $91) in China. i was expecting their new Entry Level to feature Cortex-A35 standalone or with cortex-A53 combination, making a <$25 multicore phone a reality. (the cheapest i can find is ~$30 for a single core android phone). maybe with their next entry level. The only processor with Cortex A35 I can find it is Mediatek Helio X30. It’s an high-end processor with 6 Cortex A72, 2 Cortex A53, and two A35 cores. @milkboy where you find dev board or evaluations kit, with mediatek SOC? i was juz expecting that thier new budget soc will be based on A35. its more a guess rather than based on info or rumours. there are a few MT linkit iot board. for ARM, they never release it to the public(i remember they releasing Android one dev board to manufacturer). none in the past yr AFAIK. Who knows it will change. they have the best android support in asia in my view and i could see them doing the same for linux.